We supply and fit made to measure aluminium and wooden Venetian blinds with a choice of finishes, colours and slat widths. Roller blinds and vertical blinds can be supplied with an infinite choice of colours and now we have added more specialized blinds to our product range. The INTU ™ blind can be supplied in Venetian, roller or pleated blind configurations. These blinds are ideal for conservatories and glazed doors and the blind fits neatly into the window bead with NO DRILLING required. On Venetian and pleated versions the top slide control eliminates the need for cords and loops. The solution for smaller windows is the ROLMAX ™ mini roller blind system with its 19mm diameter aluminium tube and 35 mm bracket projection, this blind is ideal where space is restricted especially on small windows where a standard roller blind would not necessarily enhance the overall appearance. 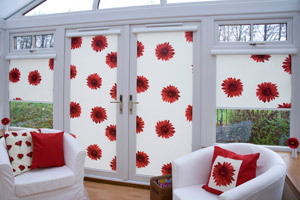 Or why not have your own individual laminated blind? 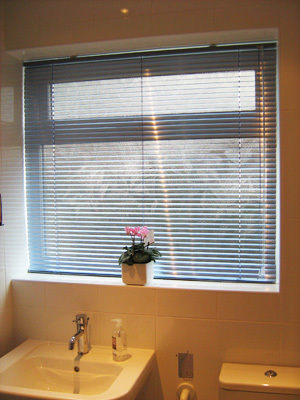 Using your own choice of material and with a choice of white, cream or blackout laminate your unique blind will be a joy to behold.